Tomorrow, Tuesday October 2, contractors are planning to conduct the final overnight interstate ramp closure in the Interstate 94 (I-94) and South University Drive interchange reconstruction work zone. Weather permitting, contractors will close the westbound off-ramp from I-94 to South University Drive overnight starting at 8 p.m. to safely install the new overhead sign truss located across the driving lanes. The westbound I-94 off-ramp will reopen to traffic by midnight on Wednesday, October 3. All other interstate on and off ramps will remain open for use. Two driving lanes in each direction are open between 17th Avenue South and 21st Avenue South on University Drive for drivers in Fargo. 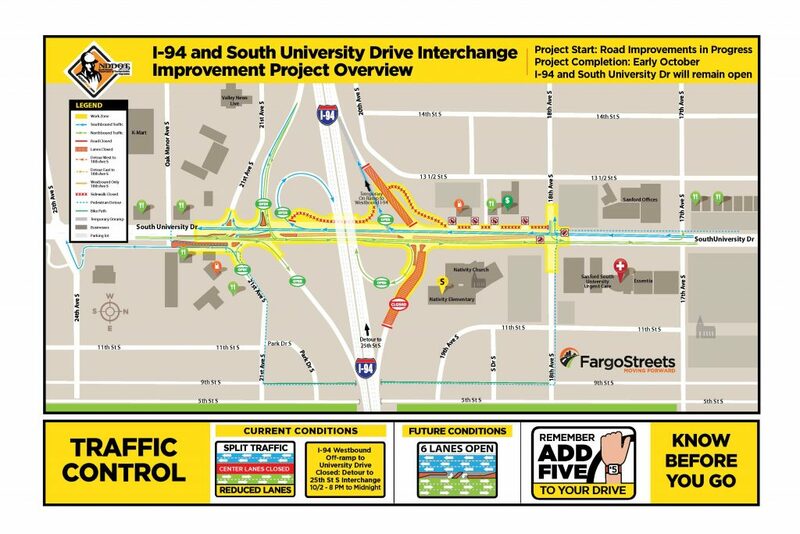 Contractors for the North Dakota Department of Transportation (NDDOT) Fargo District and City of Fargo I-94 and South University Drive interchange project are working on the final phases of project work. For the next week, crews are working to finish center median and turn lanes, new westbound on-ramp, sidewalk to connects and traffic signal installations to open the full roadway to drivers and pedestrians. One right-in/right-out access point to South University Drive from gas station and quick service restaurant. Pedestrian detour east of South University Drive by use of 17th Avenue S to 9th Street South to use the Lincoln Tunnel under I-94 to 21st Avenue S.
Flaggers are present to assist with truck traffic moving in and out of the work zone. Motorists may experience brief delays in the project limits. If an alternative route is available motorists are encouraged to use these routes to help those traveling through or turning into driveways found in the work zone.